So I'm running a Full Boar 4 v2.2.0 and Hog4PC server with a DP8000 outputting 3 universes of artNet into a Hippotizer. I also have one DMX universe of conventionals. I'm seeing some strange errant level changes in artNet when the cue I'm executing only has conventional channels changing. This manifests itself as odd unwanted blocks of media popping up and moving around on my LED panels. I have static IPs on all devices. ArtNet is unicast to the Hippo (changes only) and the Hippo is set to listen only to the DP8000. Show was created on v2.2.0. Any thoughts or suggestions? Sounds like you have duplicated outputs. 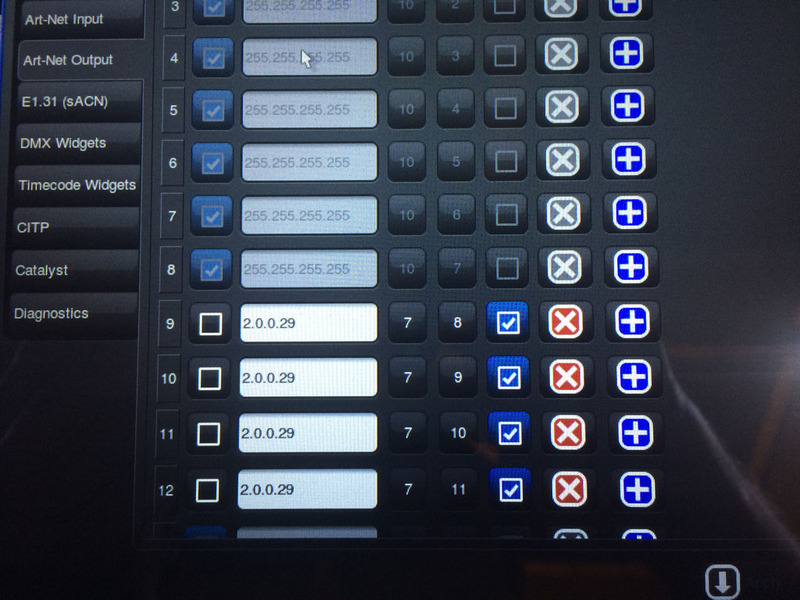 What are your Artnet/DMX DP settings? Subnet/Univ/DMX outputs? Double check the subnet & Univ settings in the network window. Try not to broadcast use the dedicated IP of the Hippotizer instead. What happens when you uncheck the "Changes only"? You mention when playing cues. Do you get the same result when changing values for the conventional fixtures in the Programmer window? You may see this in the Output or DMX windows. Does the changing value seem to always respond the same. For example if you change values on conventional number one, does it always effect the same Hippo fixtures and parameters on the Artnet output? Does conventional number 2 always effect the same Hippo fixture and parameter values on the Artnet output. etc. What outputs in the console's Fixture Window are the Hippos and conventional fixtures patched? Looking at the Sources tab of the Output window will show where the values are coming from, instead of the actual values. Do the Hippo fixtures and values indicate they are coming from the conventional cue just played? If yes, you may try opening the cues and confirm some Hippo values haven't been inadvertently added to the cues? You may also see another list showing the values for the Hippos briefly etc. possibly showing another list may be playing elsewhere as well.